Status: offline Alex, Welcome back. I hope your knee is mending. Status: offline I can see her posterior fat pad, so I know she's got a fracture. I would definitely get her to an Orthopedist right away. My PT eyes see a fracture of capitulum. In an adult with trauma, radial head is first on my mind, but I don't see it visualized here. (of course the oblique view is required for the radial head, so I guess if you left that out, that might be the cincher on the dx). Status: offline How come I don't see a fat pad? I don't see anything that concerns me in those views. Status: offline Look for the dark area between the posterior distal humerus and the muscle bulk. See how it shows up as if it were air? My opinion is that it's the posterior fat pad sign in this patient. It gets displaced upward with trauma and is visible that way. Status: offline LOL It's all dark on this screen. Status: offline I agree with Jason 100%, except for the cpaitulum- I don't see an abnormality. Radial head fracture is most likely. Status: offline Yes, the fat pad is visible. Isn't there another name for it. I heard of something with a triangle in it but I forget if it is related to the elbow. An orthopedist should be consulted here. Status: offline Thanks for the tip. Never heard of that particular name but it does make sense. From my radiology book, they mention a postive fat pad sign. Status: offline I see it in Ben's. I wonder if computer screens are different? Status: offline EVERYONE would have missed this xray, including myself unless she had point tenderness, and if so she STILL would have gone home with ortho follow up. From my vantage, the anterior humeral line looks good and the radiocapitellar line looks good, making this soooo subtle that if it was in front of you, one would respond "well, it is difficult to say, have it re-evaluated by orthopedics in 2 days" unless there were pronounced physical findings. This is using the retrospectroscope...if placed in a pile of normal films, this would be missed. In fact, this is so mild the radiologist would hedge on this unless a history was given to them. Status: offline So, Wags, what's your call on this? Do you see the fat pad sign(s) and/or capitulum fx that I do? I'm surprised to hear you say this. I have always considered a fat pad at the elbow to be a fracture until proven otherwise. I hear what you are saying about the need for clinical correlation, but the fat pad in itself is an abnormal finding. I assume what you are saying is that the patient would be put in a brace/splint and advised to follow-up with ortho? Status: offline Wow am I going to go against the tide here but the fat pad sign says one thing: hemarthrosis. This is not = fracture. Looking at the films there is NO fracture. This is what Alex asked. It may be an atypical radial head fracture (in that the sail sign is absent) but more likely a small fracture in an unexpected place. Honestly my guess would be no fracture at all. How's that for taking a position? If I were doing rounds in ortho and Dr. Wagner was my attending (with all facts in hand) he'd be shaking his head but I stand behind my position. Status: offline Yes Jeff you're right. 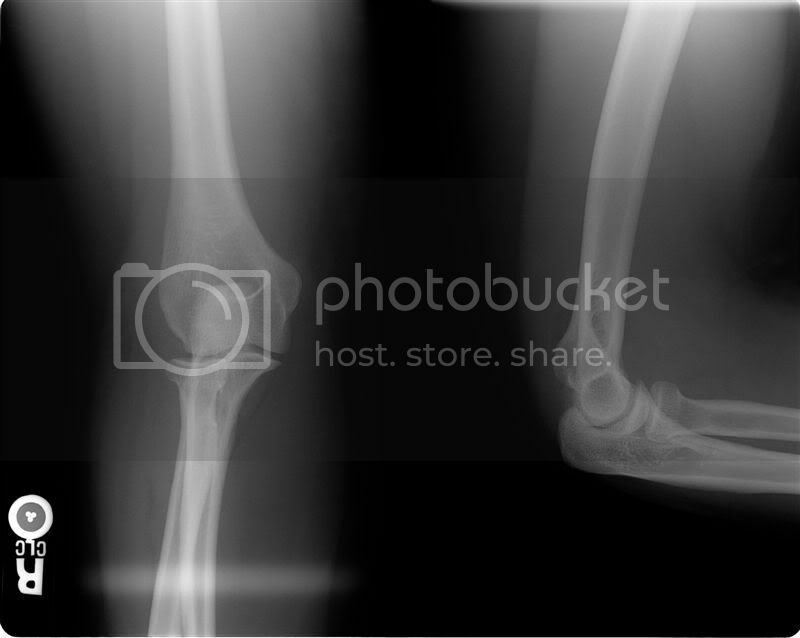 Status: offline Hopefully, the image intentionally left out will shed more light into whats going on in the elbow. Status: offline oh this is an elbow? !